The Heat Index is an index that combines the actual air temperature and relative humidity to produce a "feels like" temperature. 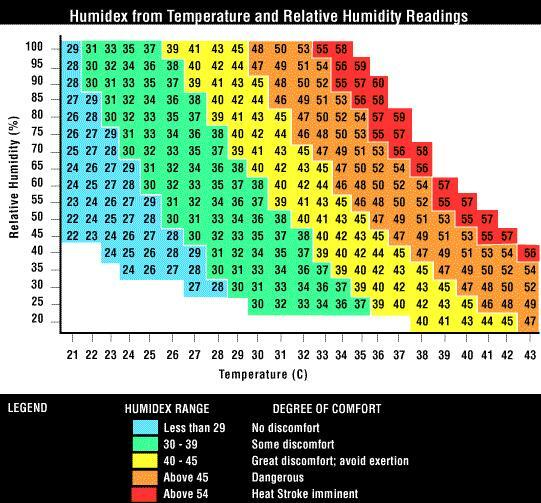 That corresponding temperature on the heat index (sometimes called the "apparent temperature" or "relative outdoor temperature") approximates what the high humidity and heat actually feels like to the average person. While the wintertime wind chill chart combines the effects of low air temperatures with wind speed to reach its "feels like" temperature, heat index charts combine the air temperature with humidity to attain the summertime "feels like" temperature. * Reduce, eliminate or reschedule any strenuous activities for the coolest time of the day. * Dress appropriately for the summer weather. Lightweight, light-colored clothing reflects heat and sunlight and helps your body maintain normal temperatures. * Your body needs water to keep cool. Drink plenty of water or other non-alcoholic fluids. It becomes even more vital during oppressively hot and humid weather that you drink plenty of fluids, even if you don't feel thirsty. Be certain you consult a physician before increasing your consumption of fluids if you are on a fluid restrictive diet, have a fluid retention problem, or suffer from epilepsy or heart, kidney, or liver disease. * Always remember that heat can be extremely dangerous to your pets as well. NEVER leave children, the elderly or pets in a parked car. Even on sunny, cooler days, the temperature inside your vehicle can skyrocket to dangerous levels in a matter of minutes. Even at home you should ensure your pets have a shady spot to escape the heat. * Stay out of the direct sun. Spend as much time as possible in air-conditioned locations to help reduce danger from the heat. NOTE: Heat index charts are based on shady conditions with light winds. Exposure to direct sunlight can increase heat index values by as much as fifteen degrees Fahrenheit. 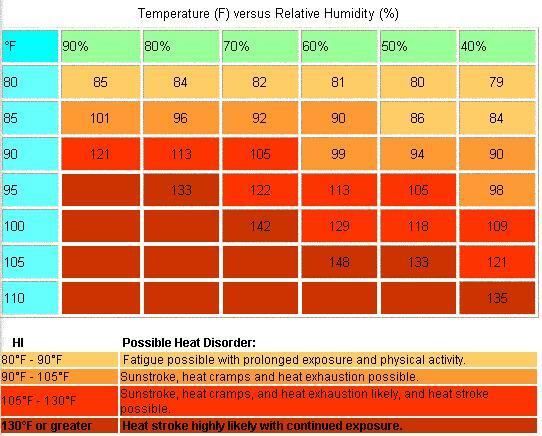 Although these charts focus on dangerous heat and humidity, keep in mind that excessive temperatures accompanied by dry air can also be extremely hazardous. These dangers are increased with continued exposure to the excessive heat and/or physical activity. Elderly persons, small children, individuals in poor health, those on certain medications or drugs and persons with weight and/or alcohol problems are particularly susceptible to heat-related medical complications or illness. 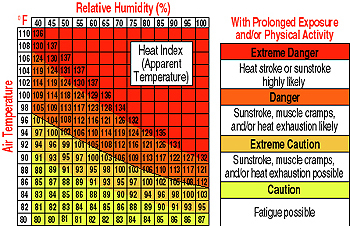 The National Weather Service (NWS) developed the heat index used to produce the charts seen below utilizing the latest research findings resulting from extensive biometeorological studies. Canadian meteorologists devised the Celsius humidex table below, while the U.S. National Weather Service was responsible for developing the Fahrenheit heat index above. The humidex table also produces a single figure (in degrees Celsius) that reflects how hot, humid air actually feels. Like the Fahrenheit charts above, this Celsius table also displays various levels of discomfort and potential danger. To determine the humidex temperature, find the value closest to your actual outside air temperature on the bottom. Follow that temperature line up until it intersects the actual relative humidity, which is shown on the left. The temperature shown at the point where these two values intersect is the humidex temperature.